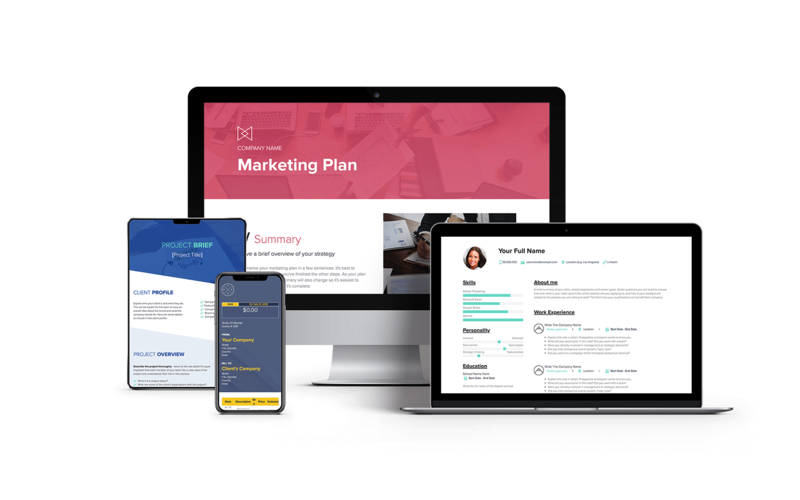 Create any template, exercise or presentation you need the launch your business: Strategy documents, personas, proposals, one-pagers, landing pages and more. Reimagine how to build your documents. Drag and drop interactive modules, add videos, charts, forms. Adjust the layout, colors, fonts. It's the easiest editor ever. Work together from anywhere under a private, branded dashboard (i.e. MyStartup.Xtensio.com). Create channels for your product development and investor materials to easily organize your workspace. Add advisors and other key players as collaborators to review exercises and deliverables or to work on reports. Edits are always in sync across all devices. And you'll always be up-to-date with in-app notifications and folio stats or revert to previous versions. Xtensio's living documents eliminate friction. Create brand continuity across your deliverables. Customize fonts, colors and templates to automatically match your branding. Or if you're defining your branding, easily update the style guide and test different styles on your one-pager. Xtensio is a must have tool for startups, UI/UX and Product Management professionals to create the following templates and demo product direction. I highly recommend using Xtensio! The Xtensio tools are great to showcase what matters in our start-up. We have all the confidence that they offer exactly what we need.